Two Michelin stars. The foundation of David Chang’s status as a chef and empire as a businessman. 13 courses. A bill for two equal to more than one half of the monthly average income in the Czech Republic. Worth it? Would we go again? Yes please!!! [2014-3-23 update: This blog post was written in November 2011 and is now outdated. Allegro was replaced by CottoCrudo, which does not have a Michelin star. Prague at this moment (2014) has two Michelin-star restaurants: La Degustation and Alcron]. Allegro, the Italian dining hall at Prague's Four Seasons Hotel helmed by the Italian chef Andrea Accordi, was the first eatery in the former communist countries of Central and Eastern Europe to gain a Michelin star. In October, chef Accordi left Prague Four Season hotel’s Allegro restaurant and was replaced by the well-known Richard Fuchs, the first Czech to be the head chef at the hotel’s restaurant. It an interview, he proclaimed that together with his team, he would be introducing a new concept of the Allegro restaurant in February. To be honest, I cannot wait.We ate in Allegro only once. The interior of this restaurant was so over-the-top ornate and reminded us of some Palais. 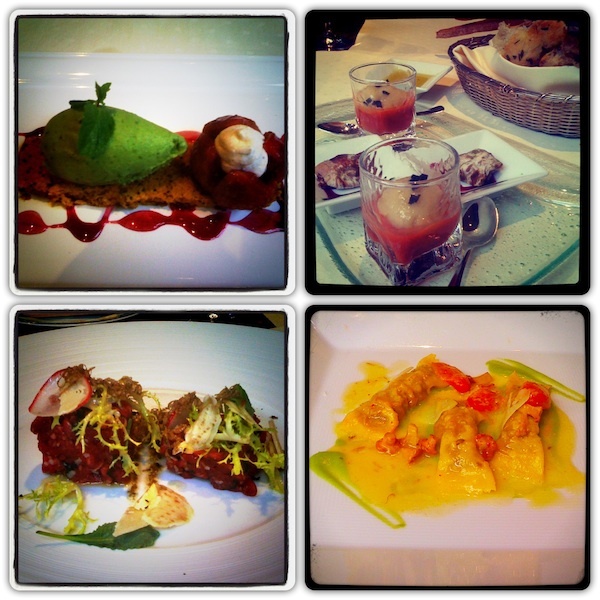 Although we generally liked the food (sorry about the pics, we forgot the camera at home), it wasn't flawless either. Overall, we were a bit disappointed: we didn't think it was worth the money. We expected a remarkable experience, but it just didn't happen. If this place had not been so highly rated and regarded, our experience might have been different, but back then we just thought there were many other more interesting places to eat in Prague? However, we have learned that Allegro will be undergoing a process of modernisation from November 2011 to February 2012, to re-open as a stylish urban restaurant, lounge and bar that offers high-quality Italian cuisine based on traditional recipes with modern twists. During the works, go to La Finestra, or contact us for other recommendations. We hope the redone Allegro with the new concept will deliver a great dining experience and will uphold the famous French accolade.